Olivia Burton presents this beautiful Rose Gold Tone 3D Bee Twiglight Chain Bracelet. 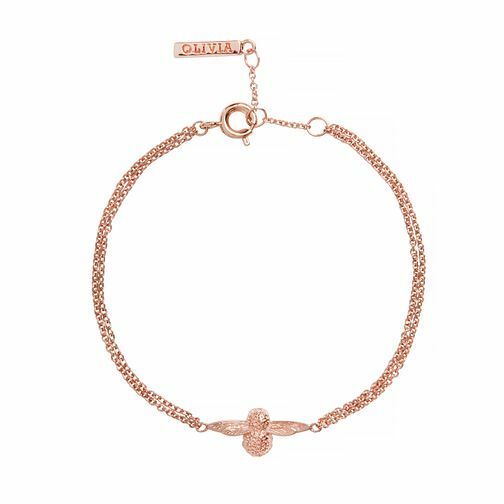 Simple in design yet stuniing in form, this bracelet features a sweet and feminine rose gold bee set on a rose gold chain that oozes contemporary chic. The perfect accessory for everyday wear. Olivia Burton Rose Gold Tone 3D Bee Chain Bracelet is rated 5.0 out of 5 by 2. Rated 5 out of 5 by Anonymous from Fabulous Bought for my daughter for xmas to match her Olivia Burton bee watch, she was delighted. Rated 5 out of 5 by Anonymous from Well-presented, high quality gift I bought this as a Christmas gift for my Mum. The packaging is very high quality, and adds a lovely finish to the gift. The quality of the bracelet itself is outstanding. Very dainty, yet looks very expensive. Would definitely recommend.